A Pain in the Neck – Literally! Neck pain can be caused by any workplace activity that strains your neck and you might feel pain at the base of your skull and down into your shoulders, or you might just feel a knot in your neck. You may also develop a headache. Serious neck pain can limit your ability to move your head and become severe enough to limit your ability to do your job. If your neck pain is worse at the end of the work day, it might be related to stress placed on your neck while working. Repeated, prolonged activities that affect muscles, ligaments, tendons, and joints cause most neck pain. I know I am not the first one to make this joke but… work can be a real pain in the freakin’ neck! Sitting at a desk in front of a computer screen for eight-plus hours, driving through downtown traffic to get to the office, and even sleeping in a funky position, can all accumulate into one hell of a stiff and tense neck. As we learned at workplacehero.me/ergonomics, creating an ergonomically correct workstation can help but it is not the be all end all. And although I have a standing workstation, take regular breaks to go move around and even do breathing exercises and meditation (by which I mean nap) many afternoons, I still get a stiff neck by the end of most work days. Neck pain can be caused by well really any activity that strains your neck. You might feel pain at the base of your skull and down into your shoulders, or you might feel a knot in your neck. You may also develop a headache. Serious neck pain can limit your ability to move your head and become severe enough to limit your ability to do your job. I got it so bad once that I couldn’t ride my bike to work and that was a real bummer. I mean, you have to be able to shoulder check, right? Holding your head forward to read a computer screen; research shows that just using a computer for a prolonged period of time can cause or aggravate neck pain. Repetitive movements of your arms and upper body. Poor lifting techniques — if you do any heavy lifting at work, your neck is at risk for damage almost as much as your back. In most jobs (not all as my nurse have pointed out to me), ergonomics can help you protect your neck. If you don’t remember from the previous podcast episode, Ergonomics is the science of fitting your work environment to your job in a way that is best for your well-being if you simply can’t change your position, get up and move around or simply say no to stay in one location for 8 hours a day. If your work is focussed around sitting at a computer station (as many of our jobs are), well then ergonomics takes into consideration how your desk, chair, and computer monitor can be placed to lessen the stress on your neck. If you work in an industrial setting (or a hospital, retail or other mobile type jobs), ergonomics may involve training you in proper techniques for lifting, standing and using heavy equipment. Ok… pardon me for a second but right now, if you are near an internet connected device, I want you to type this into a browser: workplacehero.me/getfitguy that will take you to the Quick and Dirty Tips network website where I just became the host of the Get-Fit Guy podcast. 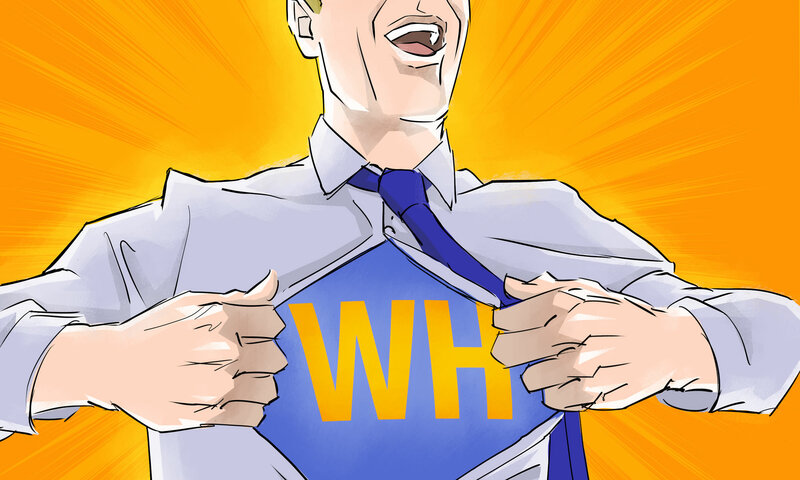 If you are a fan of the short, snappy and information packed type of podcast like Workplace Hero is, you will likely love the Get-Fit Guy (and the other Quick and Dirty Tips podcasts). The goal of the Get-Fit Guy podcast it to help you enhance your energy, lose weight, boost your performance, and get your body looking better than ever without spending a ton of time at the gym (or a lot of money on equipment). If you want to begin an exercise routine and don’t know where to start, or if you’ve been working out for a while and aren’t getting the results you want, I will give you the tips you need to reach all of your fitness goals. So head over to workplacehero.me/getfitguy or just search for Get-Fit Guy and check it out. Ok, back to how we can avoid being a real pain in the neck. I mean having! Having a real pain in the neck. Everything from keyboard height, to computer type, to chair type should be considered when making your workspace neck and back friendly. Here are some simple fixes from SpineHealth.com that will go a long way in helping your back, neck and other joints feel better while at work. A typical ergonomic evaluation at work will likely focus on providing a comfortable, adjustable chair, with or without appropriate education on how to adjust it to fit you, and a keyboard tray. Some workplaces may even evaluate the positioning of printers, screens, and the mouse. Sometimes an employer will purchase a standing desk for someone with neck and upper back pain due to logging long hours in the office. If a standup desk is not an option for you, there are inexpensive desktop converters that enable you to keep your desk and convert it to a standup desk either inexpensively and/or if you only want to stand for part of the day. For people who aren’t sure if they can manage standing up all day, this is an easy way to try it without having to change your current desk. Here are some examples of Standing Desk Converters. Your optimal ergonomic setup should start with your sitting position. When sitting at your desk, your feet should be flat on the floor, and the height of the chair should allow your thighs to angle down slightly. This position will allow you to place your weight through your “sitting bones” (called ischial tuberosities), rather than rounding your lower back and causing your shoulders to round out and your posture to slump forward. I find scooting to the edge of my chair really helps me stay straight and tall for fear of slipping off! I think this is often overlooked. We spend so much time worrying about our chairs that we forget about our hands and arm. Set the keyboard high enough so when your elbows are bent approximately 90 degrees, you aren’t forced to slump down through your shoulders to touch the keys. If the tray is too low and cannot be adjusted, place the keyboard on your desk. The mouse should be placed at the same level as the keyboard. If you use a drafting pad, it should also be at this height. Whether it is angled or not is a personal preference. Right off the bat, I am going to say that almost everyone has a monitor that sits too low. And a big reason for that is the ubiquity of laptops. The laptop is not built for a human body it is only built for portability and the sooner we realize this the sooner we will stop breaking ourselves. You have got to place the monitor so the bottom is approximately the level of your chin. This positioning can vary slightly, with a 13-inch monitor slightly higher than chin height, and a 24-inch monitor slightly lower. If the monitor is too low (say way down on your lap or even the table you are sitting at), you will slump down to work. If you work primarily on a laptop, use a secondary monitor, if possible, when you are at your desk, as the laptop screen will force you to angle your head downward and increase stress on your neck. The larger monitor should be placed directly in front of you. Occasionally a computer station includes an off-center monitor. Adjust this if you can. If you’ve ever watched a movie while keeping your head turned slightly while on a couch, you know the uncomfortable neck strain and stiffness that results. And remember what Katy Bowman said in the workplacehero.me/stand episode “swapping one static position for another is not the answer” so if you are off centre make sure you vary the off-centredness so you don’t get stuck day after day leaning to one side. Cell phones and tablets are most likely the cause of many problems when people use them for email and texting, playing games and watching shows. In my practice, I often find that people with neck and upper back pain answer emails using a cell phone or tablet at home or in the office. It’s important to limit your workload and overall use of phones and tablets. Anytime you can answer emails through an actual computer, as working on a computer offers the best chance for good posture. I was at a conference a while ago and a fellow name Kelly Starrett was speaking at it. He is the author of a book called Become A Supple Leopard and if you have any injuries, stiffness or hotspots, I encourage you to pick that book up. Anyway, after he finished his presentation I spotted him off in a corner doing something on his phone. Which is not notable in and of itself but the way he was using it was incredibly noteworthy. He was sitting in a full squat, heels on the floor, with the phone lifted right up in front of his eyes so his spine was perfectly aligned and straight all the way from his perfectly flexible hips. It was a thing of beauty… at least it was for a movement nerd like me. I know. You are probably getting sick of hearing me talk about this but seriously, sitting in an office chair seems simple, but it can be fatiguing and your posture suffers more and more the longer you sit. All of us should be doing this but if you have back, neck, and/or shoulder pain, you really must stand up and walk around the office every half hour. An easy way to do this is to set a silent alarm on your smartphone to go off every 30 minutes. It may not be possible to get up every time the alarm goes off, but it can be a good reminder that you’ve been sitting for quite a while, especially if you skip the alarm a few times in a row. That’s when that pavlok device would come in handy. If you haven’t seen this shocking device, go look it up! But anyway, setting the alarm can help you stay accountable to yourself, making sure you aren’t compromising your health for your work. This is a little more complicated than usual because it involves you going to WorkplaceHero.me/neck to watch a (pretty funny) video of Kelly Starrett (the guy I talked about who was in a squat while using his phone) showing how we can text, email and play games on our phone without destroying our necks. Now, if you aren’t going to watch the video, I am going to try to explain but I would encourage you to watch the video. To get into a proper posture, extend your arms out to your sides and rotate your palms upward. This naturally pulls the shoulders back and gets the spine into a healthy neutral position. From there, the elbows can be bent inward to hold a smartphone or type at a keyboard. Starrett then says that phones should be held up in front of your face, rather near the chest, which forces us to crane our necks downward. So for the next week, I want you to put a reminder on the lock screen of your phone to hold your phone up to eye level and not to hold it around your belly and crank your neck down to see it. You will be pleased and amazed how much of a difference it makes. I promise! Plus you look like a grown up, almost regal in your stance – not some kid doing something sneaky that she doesn’t want her mum to see. I’ve said it before and I will say it again, the body wasn’t meant to sit all day long and stare at tiny screens. To offset this unnatural activity, a bit of effort is required to keep us healthy and happy. But we Workplace Heroes aren’t afraid of a little effort. We embrace it. With a tall and straight spine and properly aligned neck. Now go make this week an upright one.